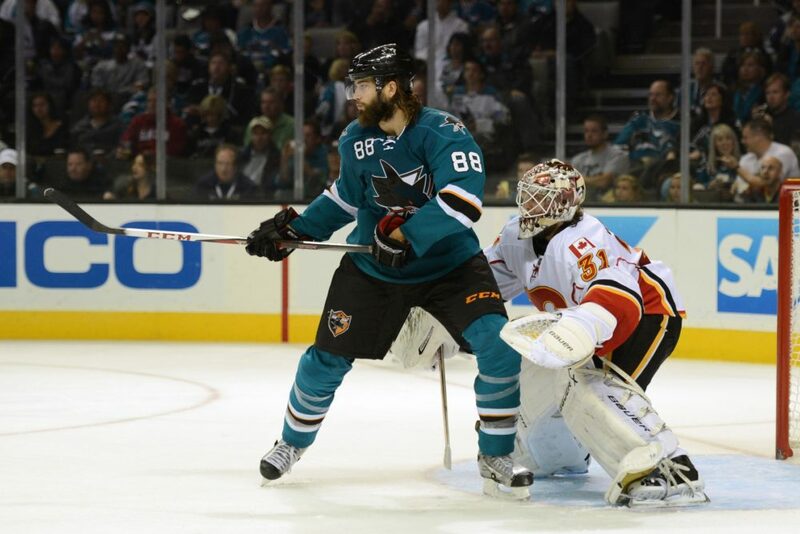 Over the past four games, the San Jose Sharks have allowed seven goals. Forward turned defenseman Brent Burns has been on the ice for all seven of them. We all know hockey is a team game and there have certainly been other factors contributing to the goals against. However, Burns has simply not been very good without the puck this season. While Burns leads the league in points from the blue-line with 13, being on the ice for seven straight goals against is eye popping. Granted a couple of the goals against were special teams situations but the last four in a row have been via even strength. For the season, Burns’ 2.50 GA/per 60 even strength minutes ranks him fifth out of the seven defenseman the Sharks have used this season. The only two defensemen worse in this metric are his rookie defense partner Mirco Mueller and Matt Irwin, the latter of whom has been scratched the past four games and owns a minus-6 rating. Both Scott Hannan and Jason Demers, who have had their struggles defensively, have given up fewer goals against while five aside than Burns, even when adjusted for ice time. While these two have notably lower defensive zone face-off percentages than Burns, that alone does not leave Burns off the hook. Below is the NHL.com highlights of the 4-3 shootout loss to the Minnesota Wild this past Thursday, Burns is on the ice for six out of the seven Wild chances in this video including all three goals. The Sharks have given up 23 even strength goals, and Burns, whom GM Doug Wilson compared to Drew Doughty, has been on the ice for nine of them. A top defenseman shouldn’t be giving up 40% of the goals against at even strength. In comparison Doughty’s GA/60 minutes is 1.32, and Burns’ teammate Vlasic has allowed just five even strength goals against. In 13 games we’re talking about a small sample size but according to Wild fans reached over Twitter, Burns was frustrating to watch as a defenseman during his Minnesota days. @ViewFromBensch Burns was so frustrating when he was w the Wild. 1st pairing talent (and then some…), 3rd pairing hockey sense. Perhaps Burns can clean up his defensive lapses as he does have defense guru Larry Robinson as one of his coaches. But Burns is just one of those guys wired for offense. He is a mistake prone player, and one who is as skilled as a forward as he is ought to be playing forward so those mistakes can be bailed out by actual defensemen and not end up in the back of the net. You’ll see in the video above that Burns gets left out to dry on the second goal against vs Minnesota as he had to defend a two-on-one situation. You look closely however and Thomas Vanek never even thinks about shooting, he corrals the pass and dishes to Kyle Brodziak in a continuous quick motion with his head down. Burns meanwhile has his stick on the wrong side. His stick in this situation is pretty much useless as Vanek is firing towards Brodziak’s direction the whole way. Burns, the natural winger (not a natural defenseman), looked very much like a forward trying to defend the two-one-one. On Minnesota’s third goal Burns gets caught pinching along the boards and this time leaves his partner out to dry on the two-on-one. This is simply a bad read and slow reaction to getting back on defense. Brodziak burns past Burns who inexplicably starts gliding just inside the blue-line instead of tracking hard back to the net. Brodziak had a step or two on him but was slowing down as he reached the high slot expecting the pass. Had Burns kept skating he could have possibly reached in to either break up the play or in the very least take a penalty to save a goal. And finally in San Jose’s most recent game against the Islanders, Burns skates out of position and attacks Kyle Okposo who makes a nice but simple power move around him. In this case Burns again leaves his partner Hannan in a tough spot having to defend a two-on-one situation. On this play Burns cannot stab at the puck and give up the lane to the net. Possibly there is some micommunication initially with Joe Pavelski but regardless, defensemen should not be deserting the middle of the ice on the rush and stabbing at the puck carrier. It is a good move by Okposo but nothing special. Fortunately for the Sharks it was the only goal they allowed on the night but it is just another example of bad defensive zone coverage by Burns. Not only has the former Wild defenseman been on the ice for a large percentage of goals against, but he also was guilty of a bad giveaway in the third period against Columbus. He subsequently took a penalty shortly thereafter that allowed the Blue Jackets to tie the game on the ensuing power-play. He may be a point producing machine on the blue-line thus far but he is an offensive minded player that makes a much more positive impact as a forward. He helps the team as a winger by balancing out the lines, and allowing the third line to become a dominant scoring trio. Moving him back up front certainly won’t take away from the team’s ability to prevent goals by virtue of his poor defensive zone coverage. He can still play the point on the power-play, so nothing has to change there. Plus the biggest kicker is that possession wise, the Sharks wouldn’t lose much at all on their back end. As Fear The Fin notes, Vlasic and Jason Demers put together a dominant corsi for percentage last year. @ViewFromBensch Demers has had a brutal start to this season but he and Vlasic were a 59% Corsi pairing in tough minutes last year. A second pair of Mirco Mueller with Justin Braun would be a much stronger pair defensively than Burns-Mueller, plus Braun has vastly underrated puck moving skills himself. Overall, it is hard to say the Sharks lose much of anything in their top-four without Burns, but they gain a whole heck of a lot up front with him on that top line. No doubt the Sharks would still be wise to acquire some defensive depth come the trade deadline, but a third pair of Matt Irwin/Scott Hannan and Tayor Fedun could suffice for the short term in limited minutes. The main detractors of Burns moving back to forward believe the Sharks can’t afford to move him with an already “thin” defense. However, that defense looks much, much better when Vlasic and Braun are spread apart. Vlasic makes Demers into a top pair quality puck mover, and Braun could do wonders for the development of the rookie Mueller, who could end up establishing himself as a legit top-4 defender by the time the playoffs come around. If necessary, there are defenders out there that may be available in the trade market, the Oilers’ Jeff Petry and the Hurricanes’ Andrej Sekera come to mind as options that wouldn’t require a huge return.